The resulting screen will display a Date Range selector, Level Keys, Language Summary Charts and either a Test Results list or a list of classes that you can select to drill into to access the Test Results list. The Date Range defaults to six months. To select a different date, type the date or click the calendar icon, then, click Search as shown in the image to the right. 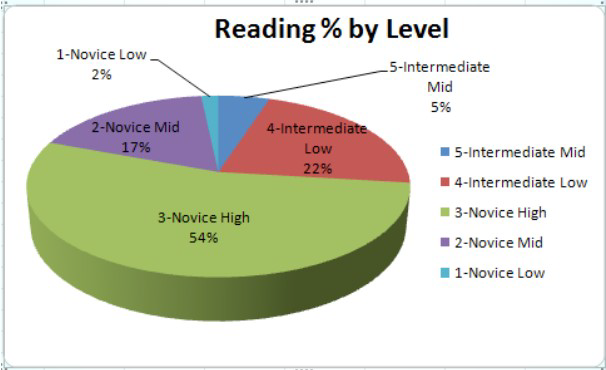 Scoring is done using Benchmark Levels 1-9 for Reading and Listening and Benchmark Levels 1-8 for Writing and Speaking. The levels are associated with Benchmark Categories of Novice, Intermediate and Advanced as shown in the Level Keys below. This Benchmark Scale relates to the ACTFL scale as shown below. For more information, see the Hebrew Benchmarks and Rubric Guide. The Test Taker lists show test information for each test taker. These lists will start to show data as soon as the test taker completes the Student Profile screen. Reading and Listening scores are available as soon as the test taker completes those sections (refresh the page for updates). Writing and Speaking scores are typically available in 3 to 7 business days. They may be available sooner, so check the test results screen periodically to determine the grading progress. If you are using a district/organization or school/sub-organization viewing code, use the View Summary feature to drill-down to the desired class/testing group. If you have students that accidentally skipped a test section due to technical issues, a phone call to client support with the student's Login Name, Test Code, and specific section will bring an immediate solution, as they will be able to reset the test or section. You can also send an email to support for non-immediate requests and questions, listing the student's Login Name, Test Code and providing a brief description of the issue or topic to help the support team investigate the matter and provide a response. Student Login Names can be located on the Teacher Results viewing account screens. Providing the exact Login Name ensures that we will reset/delete the desired login, as other logins are often very similar, and we would hate to delete any of their work unintentionally. Individual Reports show the Reading, Writing, Listening and Speaking levels attained on the Avant STAMP for Hebrew test for each test taker. They provide in clear, direct language what test takers at each level are generally able to do. Each test taker’s report has a scoring graphic for each section of the test. This inverted pyramid has a yellow-filled area that depicts the level attained. The level is also shown in the red bar for each section of the test.